Every studio has Snap-worthy views of the lake and surrounding mountains. (Your followers will be so jealous). Waltz on out to the private beach whenever the mood strikes. There's a lounger with your name on it. Relax and recoup after an adventure filled day - whether on the lake in the summer or on the slopes in the winter. Because sometimes the thing you want to do most is nothing at all. Get up early and don’t miss the fresh powder at Northstar California Resort, only a 15 minute shuttle ride away. Staying in the heart of downtown Tahoe Vista puts you by all kinds of exciting shops and dining. Located on Lake Tahoe the resort gives you an easy access to a private beach. Relax with a deep tissue massage or rejuvinating facial at North Lake Massage & Skin Care. There are 2 outdoor hot tubs at the resort, perfect for recouping from an action-packed day. Lace up those hikers. Brockway Summit Tahoe Rim Trail Trailhead is just a 7 minute drive from the resort. Old Brockway Golf Course is a 3 minute drive from the resort – so toss your clubs in the car and go. Leave it to a family-owned lodge to create a resort with everything you could need to keep the whole crew happy. Nestled in the middle of North Lake Tahoe with 275 feet of private beach and an array of toys and activities for all ages, the Mourelatos Lakeshore Resort is the prime locale for a waterfront getaway. When you get to your inviting studio, your eye will immediately be drawn to the stunning views of the water. The very sight of the lake will have kids in swimsuits and begging to hit the beach before you’ve had a chance to settle in. Follow their lead, dig out the sunscreen and leave the unpacking for later. Once on the beach, park yourself in a cushioned lounger and get lost in that bestseller paperback (finally!). Join the crew for games of corn hole or ping pong between chapters. You won’t need to bring your usual arsenal of beach gear – the resort has everything covered. Loungers and cabanas, kayaks, stand up paddle boards, paddle boats and various games are all at your disposal – not to mention the (famous) water trampoline. When stomachs start rumbling, fire up one of the barbecues and throw on some franks for a quick lunch – or delegate the meal to your crew’s self-proclaimed grill master, and sit back while someone else cooks for you. Once everyone’s thoroughly beached out you’ll be glad to have a homey crash pad (and comfy bed) to return to – perfect for pre-dinner power naps. Thanks to a full kitchen, you have the option of staying in and treating your crew to your signature dish. Over dinner, game plan for tomorrow – SUP yoga? Kayak tour? Maybe the Mountain Survival Game? (Loudest “yessss” wins.) Time your evening just right so you can take your post-dinner beverage out onto your suite’s patio to admire the view as the sun sets on the High Sierras. Declaring it a dinner-out night? 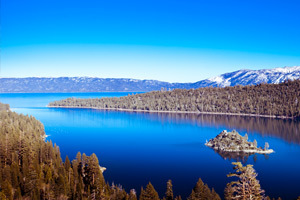 You’ll find several options nearby, including some of Lake Tahoe’s most beloved eateries. Gar Woods Grill & Pier is just minutes away by car (or by boat! ), dishing up California-fresh seafood, classic American fare and a kid’s menu – plus an adjoining speedboat museum. MLR remains a family haven in the winter too, with access to 18 acres for snowshoeing and cross country skiing, fire pits for s’mores and a shuttle to nearby ski resorts. - Front desk is open 8:30 AM-8:30 PM daily. Hours may vary. Guests that are planning to arrive after hours can pick an envelope with check-in instructions by the front desk. For more details please contact the property using information on the booking confirmation. - 24-hour airport shuttle service is available at scheduled times. Contact the property in advance to make arrangements. If guests arrive after the front desk closes, the check-in information will be left on the door for them.